Since I'm a bit behind with my beauty box posts, I decided to consolidate both boxes I get into one monthly review post. I also think it'll be easier to compare them if they are in one post if you are thinking about getting a subscription and you don't know which of the boxes to get. 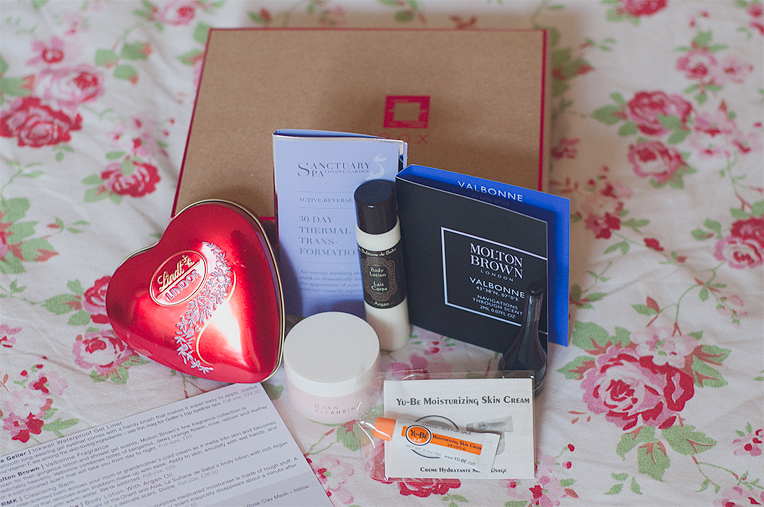 So without further ado, here are my thoughts on both the Birchbox and Glossybox-March edition. My Birchbox had a theme "Role Models" to tie in with the Mother's Day here in the UK. 1) Laura Geller waterproof gel liner (2.5 g sample worth £12)-I can't say I'm a dab hand with eyeliners, but this comes with the cute little brush and it's the darkest, blackest black. It's a good sized sample as little goes a long way with liners. 2) Molton Brown Valbonne fragrance (2ml sample worth £2.6)-A unisex fragrance that smells divine. 3) RMK cleansing balm (25g sample worth £7.25)-This smells of roses, looks super greasy in the pot and I really shouldn't love it, but I do. It removes make up beautifully. 4) La Sultane De Saba body lotion (30ml sample worth £5.3)-This lotion is made with argan oil and it smells gorgeous. My only complaint is that I wanted more of it. 5) Yu-Be moisturizer (3g sample worth £0.8)-Smells like primrose and it does what it says on the tin. I didn't find it super special, but apparently it's a big bestseller in Japan. 6) Sanctuary mask (sachet sample worth £6.30)-This is super expensive and I did get it in one of the previous boxes. Alas, whilst it's nice to use, it's very difficult to judge long term benefits as a sachet size sample only allows for one application. 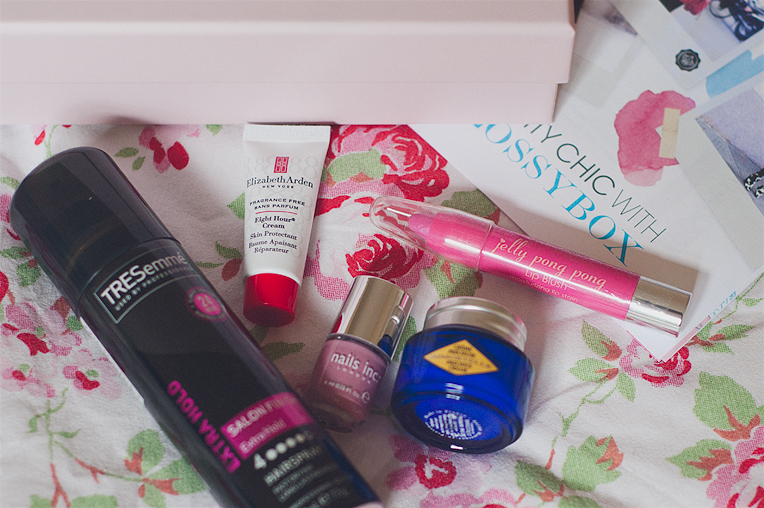 The same month's Glossybox had a theme of "City Chic" celebrating polished look that city girls have. 1) Elizabeth Arden 8 hour cream (7ml sample worth £3.5)-This cult cream is a bestseller but I'm afraid it's lost on me. I did buy it previously, but I just wasn't wowed by it I guess. Other people, on the other hand, swear by it. I guess you can't please everyone all the time. 2) Nails Inc nail polish (4ml sample worth £4.4)-I have to say I don't like teeny tiny fiddly brushes on any nail colour samples, but the colour of this polish ticks all the boxes so I'll forgive them the brush. The colour is Bruton St and it's the perfect dusky pink. 3) L'Occitane Immortelle cream (15ml sample worth £12.9)-I love this. Even the sample size feels and looks luxurious. It's an amazing anti ageing cream and it smells gorgeous. 4) Jelly Pong Pong lip blush (full size worth £12)-It's a lip stain and moisturizer in one, the colour is nice, but I just don't like any of the chubby sticks for lips...They're a bit of a waste of time as far as I'm concerned. Give me a lippy or give me a balm. Together...I'm just not so sure. 5) Tresemme hair spray (100ml sample worth £0.9)-It's a hairspray that we can all find in supermarkets. Not a particularly luxe product, but it will do. I did overall like both of the boxes; they had a good mix of various products and with the exception of lip blush I will use them all even though I like some things more than the others. My Birchbox contained £37 worth of products and my favourites were the body lotion and the perfume sample. Glossybox contained £33.7 worth of product and my favourite was the L'Occitane cream. Did you try any of these products and what did you think of them? I really like the yu-be moisturizer! I get super dry skin and it really helps :) I feel you about the mask, any super tiny samples that are supposed to cause long term benefits are difficult to truly sample. Thanks for the review. I haven't used any of the products but I have eaten the Lindt chocolate too. The perfume sample smelled gorgeous, I really wasn't expecting it to for some weird reason even though I like their shower gels lol, xoox. I'm afraid I'm one of those people who swear by the 8 Hour cream. It's been a constant in my makeup bag for the last 10 years and even the Grumps knows to ask for it when he has chapped lips (poor dear). I like these boxes! The products look to be great!